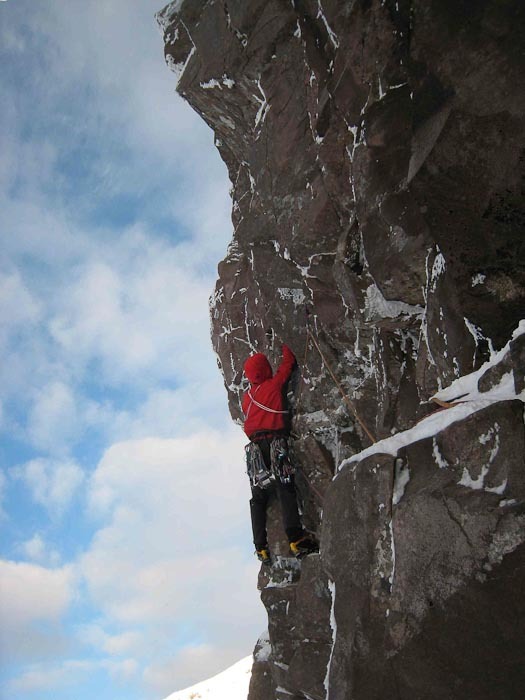 A long standing problem in the North-West was put to bed yesterday (March 3) when Guy Robertson and Iain Small made the first winter ascent of Sherlock on Fuar Tholl’s Mainreachan Buttress. This steep HVS line on the vertical right flank of the buttress has been the target of several teams in recent years. One very accomplished pair had tried it three times before conceding defeat. Guy and Iain were surprised to encounter footsteps high up on the route. It turns out that Rich Cross and Andy Turner were there on Monday March 1. They climbed a line graded VI,7 that starts up Moriarty, then follows Sherlock pitch 2 and half of pitch 3, before going away out left and back right and continuing direct to the top. This entry was posted in New Routes and tagged Andy Turner, Dave Hesleden, Fuar Tholl, Guy Robertson, Iain Small, Rich Cross. Bookmark the permalink.